I can't wait to show you the new little sofa in my living room that arrived from Berlin! It looks so sweet and acts as the perfect placeholder for the larger one I'm about to order for the opposite wall (I'll put this baby elsewhere once it arrives). I'm in the process of renovating this room but for now, this little sofa looks so sweet. Later, it will go in another room since my apartment has enough room for it to move around - something I really love about living in this place other than the abundance of natural light. This darling sofa is the from Fashion For Home in Hellgrau and I love it. It's comfortable, it's stylish, the tufting is gorgeous and the quality is tops. The frame, made of wood, is also visible and quite gorgeous. I am so happy to have this piece of furniture in my home. It's so hard to choose a sofa though, don't you think? So many options and often, you aren't sure what to go for. For me, I had a few "wishes" on my list. Wooden base and legs, gray, tufted, clean lines, comfortable but not "cushy". Tesoro ticked all of the boxes for me so I'm very pleased that it's joined the family. 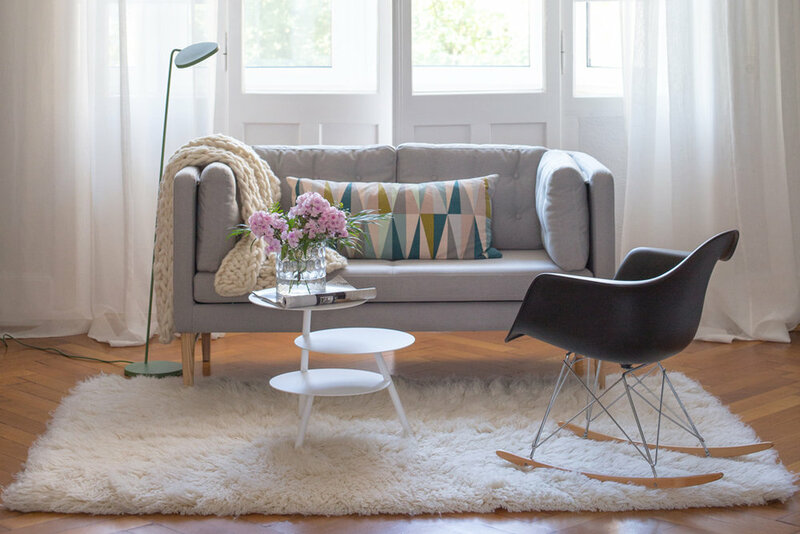 Fashion for Home is a great furniture website with some retail stores in Germany, with a wide selection of beautiful pieces that are definitely not like the generic big box stuff you find in most furniture retailers. They tend to be very Scandinavian style and trends-driven, which I love because everything is current while also being timeless, so you could buy a sofa today because it's very "in" but because it's also very classic, it will be "in" for the next ten years. I also selected a neutral base of gray which allows me to change up the pillows and throws easily without worrying too much about matching perfectly. By the way, there is a little interview with me in German up on their website, check it out . Other items shown: The flokati rug came from Amazon (it was originally in the baby room), the Eames Rocker I've had for years, the table is from and is a few years old, the green is from Muuto, the is from Ferm Living, the handmade throw was a gift from Anette at , the drapes are Belgium linen custom made from , and the pendant light is the from Vita. Please note: This post is in collaboration with , however I was not paid to post this review. All content and words are sincere and this review is my own.